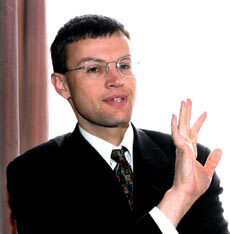 Lothar Jaschke is Minister-Counsellor with the Austrian Embassy in Sofia. He was born in 1966 in Villach, graduated the Economy University in Vienna and specialized in the United States and Denmark. He worked with A.S.A Abfall Holding, Vienna, from October 1992 till October 1994. In 1994 he was in charge of relations with the countries from Central and Eastern Europe and EU expansion at the Foreign Ministry. In charge of relations with the countries from Maghreb and Maschrek at the Secretariat of the Council of the European Union till December 2002. He has been working with the Austrian Embassy in Sofia since December 2002. Q: The Austrian music days will mark the 125th anniversary since establishing diplomatic relations between Bulgaria and Austria. Would you agree that Austria's culture has found its most characteristic expression through music? A: 125 years ago Austria-Hungary was the first state in the world - after Russia of course - to recognize the sovereignty of Bulgaria and to establish diplomatic relations. On the 20 July 1879. Other countries then followed. The decision in Vienna has contributed a lot to the Bulgarian statehood. Many events commemorate this event all through the year. The Austrian Music Days are one of the greatest. Music is an essential part of our cultural identity. Many Austrians love music, and here I speak of classical music, the concert halls are almost always sold out and better frequented than soccer stadiums. For contemporary music scene I would recommend to consult www.mica.at and also the museum of music which opened last year in Vienna. Many Emperors from the Habsburg family played music, the most famous being Emperor Leopold I (1640-1701) who left 280 large and small pieces of music. Emperor Josef II used to greet W.A. Mozart by playing some of his piano music. Musical education is widespread. Music and Vienna go close together a foreign correspondent to Vienna once remarked. Austria is very fortunate that genius like J. Haydn, W.A.Mozart, F.Schubert, L.v.Beethoven, G. Mahler, A. Bruckner, but also J.Lanner, J. StrauЯ father and son, A.Berg, and many others lived, worked and played in Vienna and profoundly influenced its society. Today about 800.000 people make their living on music in Austria - composers, conductors, orchestras, the music industry, managers, agencies etc. And the rich contribution of many ethnic Bulgarians to the music scene in Austria like Mario Serakov (Bruckner Ensemble), Simeon Pironkov (Ensemble Wiener Collage) or Maria Prinz (pianist and professor) is very appreciated. After the First World War, when Austria lost 7/8 of its territory it gained credibility and sympathy mostly by staging classical concerts. Q: What is the history behind the Second festival "Musical Bridges across United Europe"? A: The idea of the overall theme of the Austrian Music Days is to bring music written by composers from different countries together and to strengthen the international character of music. Music needs no translation and no go-between; its essence and its language are international. The program director of the Music Days will try to stage music from other countries like France or the Czech Republic. I can only speak for the Austrian music days which will last from 3. to 9. of May in Sofia and Plovdiv. They have been established already in the mid nineties and are now staged for the 8. time. The festival will open with a concert in Bulgaria Hall on 3 May, 19h00. The philharmonic orchestra will play with Austrian soloist Karen de Pastel, Mr. and Ms Renner and Srebra Geleva Mozart, Doppler and contemporary music from young Austrian composers like de Pastel, Steinkogler, Wagner and Schneider. Mr. Steinkogler will be present. I am looking very much forward to this concert and invite your readers to come along. Tickets will be available at the box offices for free. The two Chamber Concerts in Balabanov House in Plovdiv on the 4th and 5th of May will also feature music from Austrian contemporary composers. Maybe the most sustainable effect from the Austrian Music Days are the master classes in organ, flute and violoncello in Plovdiv. The festival will close with a concert by the soloists in the beautiful cathedral Sveti Ludwig in Plovdiv, exactly on Europe Day. Q: Do you think Bulgarians are well-acquainted with Austria's cultural treasure? What do Austrians associate Bulgarian culture with? A: I have to pay great tribute to many Bulgarians who are well acquainted with music but also literature and art from Austria. This is due to the great Bulgarian community in Vienna. But also due to the remarkable intellectual and cultural level in Bulgaria. Vice versa I think that due to the presence and kinship of many Bulgarians in Austria there is also knowledge of Bulgarian culture. Maybe the most famous are the Bulgarian opera singers in Vienna like Ana Tomova-Sintova, Weselina Kasarova and Nikolai Gjaurov. Boris Christov is well known I think as is Christo the "wrapping-artist", the women choir from Bulgaria and traditional folk instruments like kaval and backpipers even if people do not necessarily associate them at once with Bulgaria. Diana Dafova will stage a concert in October in Vienna. She is undoubtedly a very capable singing Ambassador as she blends her popular songs with these traditional instruments and Bulgarian folk music. Recently Dimiter Dinkov from Plovdiv who lives in Vienna since 1990 has gained enormous popularity with his new book "Engelszungen" (tongue of Angels), written in German. It gives a very likeable picture of Bulgaria. I grew up, in Vienna, with the paintings of the Sofia born artist Milcho Shishkov who lives in Austria since 1969. I hope that he will come to his native town next year to show his pictures and plastic. The cultural institute in Vienna named after an influential Austrian philosopher, Ludwig Wittgenstein, is certainly instrumental in introducing Bulgarian culture to many Austrians and even more so to foster bilateral cultural relations. Q: Could you tell us more about the Embassy's activities to foster academic and cultural exchange between Austria and Bulgaria? A: Our task is twice fold: to introduce culture from Austria in all its forms - film, music, paintings and sculpture, literature - and its creators to Bulgaria and to demonstrate the Austria is a country which cherishes culture and promotes cultural exchanges. In this way we would like to contribute to the well-being and diversity of the art and music scene in Bulgaria and support Bulgarian artists/musicians. Culture is an integral part of our foreign policy. The Embassy is trying to manage the cultural program with very limited resources. Unfortunately we have no Austrian cultural forum, but we are lucky to have a cultural network consisting of two Austria multi media libraries in Sofia (a.o. 12.000 books and many personal books from Blaga Dimitrova) and Veliko Trnovo (a.o. 6.000 books), three Austrian lectures in Sofia, Plovdiv and Veliko Trnovo and the Embassy itself. I might add KulturKontakt Austria in Vienna which supports Bulgarian artists. Let me give you but one example. In the libraries we also organize presentation of books and lectures - like the one of Robert Menasse on 28. April. This year we had Adolf Holl, an eminent writer and theology, and Prof. Konstantinovic. On 20 April we presented a book on Erich and Carlos Kleiber by Tomislav Vichev. We co-organize events dedicated to anniversaries of personalities like, for this year, Karl Krauss, Joseph Roth, Ludwig Wittgenstein, Anton Bruckner, F. Mayrцcker and others. Next year we will celebrate 100 anniversary of Elias Canetti with many festivities. In 2006 we will celebrate all year long Mozart's 250th birthday. To commemorate the 125 years of diplomatic relations we had a great Jubilee concert in March in Sala Bulgaria with Georgi Minchev's Piano Concerto and W.A. Mozart's Haffner Symphony. We will stage a double exhibition showing the Emporer's tablewear and modern paintings in the national Gallery for foreign art from 8 July onwards. We will also publish a book about the history of Austrian diplomatic representations in Bulgaria, including the consular agencies in Vidin, Varna, Burgas, Plovdiv, the general consular agency in Rousse and the Austrian-Hungarian post administration. A Jubilee exhibition will open on 10 November in the National Library Sv.Sv Kiril i Metodi. I am very pleased that Austrian superstars like Dorain Rabinovici, Robert Menasse, Bruckner ensemble - (concerts on 8 June in Pernik, 9 Juni in Sala Bulgaria, 10 Juni in Plovdiv), Consilium musicum Wien (concert on 11 May in Rousse) and Robert Menasse (lecture on 28 April in the University Sofia, 30 April in Plovdiv) will come to Bulgaria. And of course the four solists - Karen de Pastel (organ), Mr. And Ms. Renner (flute) and Georg Baich (violoncello) - for the Austrian Music Days. These are some of the cultural highlights of the Great Jubilee. More than 5000 Bulgarian students - some of them stay on in Austria - testify to the excellent human relations. The K-education office supports Bulgarian schools, providing a network with others schools from Southeast Europe and Austria. The Austrian Science and Research Liaision Office ASO is instrumental in fostering a rich scientific exchange. Bulgaria is participating successfully in European programs like Sokrates, Leonardo, Media+ and Culture 2000. Let me add that the CEEPUS, the Central Eastern European University Exchange Program works very well. Q: Do you think the two countries continue to be receptive to cross-cultural interaction? In what way? A: Yes I do, very much so. Culture is treasured and a feature of every day life in both countries. Cultural manifestations are not necessarily "elitist", intellectuals are highly esteemed and reported about. Maybe, judged by my modest observations, in Bulgaria even more so. The artists themselves who travel back and forth carry the exchange forward as well as the expatriate communities in both countries and institutions like the Wittgenstein house in Vienna and our cultural network in Bulgaria. Q: Which features of the Bulgarian culture does the community in Austria bring to the country? A: I have no real contacts with the organized Bulgarian community in Austria as I am so busy with the Austrian interests in Bulgaria of which is one the well-being of the (much smaller) Austrian community in Bulgaria. In general terms I have already answered in my response to your third question. Q: Don't you think people from Eastern Europe are much more inclined to switch to and adopt foreign values and cultures than Westerners and Americans? A: No, I hate these generalizations. Culture - and the values that go with it- is the software of our mind. It is so deep that any adaptation is a profound, slow process. New trade marks, new trends, changing of fashion are but temporary symbols. Culture and values are by nature international, not national and cannot be confined to any kind of borders or restrictions. Art will find its way everywhere if it is sustainable. Art is not subject to political trends. A closed society has no future. Any attempt to lock societies away is doomed to failure. Today we live, thanks God, in multicultural societies. Who is the "people from Eastern Europe", who is the "Westerners" you refer to? These are millions of people each with their own history, education, socialization of which the country their were born in is only one. There are many wonderful, warm, hospital, well-meaning persons everywhere as there are egoists and criminals everywhere. I personally believe in the good nature of people and I have very rarely been proven wrong. And even then we have to ask ourselves why and what has turned somebody into a personality with negative features?